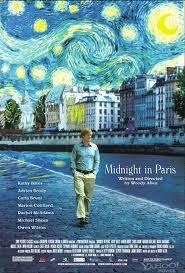 People have been talking about how much they like the new Woody Allen flick, Midnight in Paris. I think people seeing the film in San Francisco are going to appreciate Allen's movie about the powerful hold that nostalgia has on our lives (a near-constant theme in Allen's cannon) more than other audiences in cities around the world. The reason for this is because of the many scenes in the movie devoted to Gertrude Stein's Paris and the artists and writers that populate her world. San Francisco is in the midst of a cultural celebration of Stein, with several institutions, including the San Francisco Museum of Modern Art, The Contemporary Jewish Museum and Yerba Buena Center for the Arts, all mounting exhibitions and other events devoted to the iconoclastic art patron and author. I blogged about our city's "Summer of Stein" a little while ago, here. Having visited both the SFMOMA and CJM shows, it felt lovely and slightly surreal to see Picasso's portrait of Stein and other iconic works created by the members of Stein's clique in 1920s Paris that are currently hanging on the walls of San Francisco art institutions reproduced in the film. The portrayal of Stein by Kathy Bates was both hilarious and sensitive. Watching the actress play the art doyenne on screen made the exhibitions about Stein currently unfolding in San Francisco come to life in an even more vivid way.